If Homer Simpson were real and living in 2013 New Orleans, he’d ditch the nuclear plant gig, grow a beard, and go to work at District Donuts and Sliders (2209 Magazine Street, 504.570.6945). District occupies a thin sliver of Magazine Street storefront, just upriver/uptown of Stein’s Deli. Exposed brick walls, hipster-ish employees (all abundantly bearded on a recent Sunday afternoon), 1000 Faces coffee, and Lazy Magnolia beers lend a feeling of Brooklyn meets the South. The doughnut-n-coffee side of the menu shares space with sliders and beer, giving District an all-day bustle. Counter service and deep booths encourage lingering. Pictured at left is a salted caramel glazed doughnut, notable for its feathery light texture and distinctly yeasted flavor. I didn’t get to try a kolache (available until 10:30 am), mainly so I’d have an excuse for a return visit. are they as good as Mr. Ronnies???? I think they’re light years better than Mr. Ronnie’s. 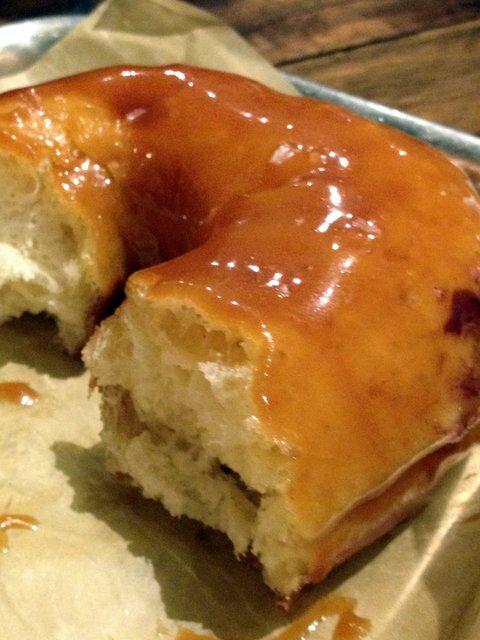 Less sweet glaze, and a lighter textured, more yeasty doughnut. District also makes kolaches filled with BOUDIN. Now the question is… are they better than Blue Dot? Or just different in style? The doughnut itself was lighter and fluffier than those I’ve eaten from Blue Dot. Toppings-wise, it’s probably neck and neck. Blue Dot’s selections tend toward the more-is-more school (red velvet, maple bacon) and District’s selections were a little more restrained and less sticky sweet (though I did see a seriously decadent looking cream filled being devoured at the next table).